Welcome to Christmas Mountain Village, Wisconsin Dells' premier golf and ski resort. Guests of this resort enjoy one of the Dells' best 27-hole championship golf courses and a pristine groomed hill for downhill and cross country skiing in the winter. The twenty-seven hole golf course winds through the middle of the resort offering great views and recreation during the summer season. Four outdoor pools and hot tubs are situated throughout the resort and the ski hill provides a perfect backdrop and winter recreation for all ages. Offering some of Wisconsin Dells most spacious accommodations, choose from one and two bedroom villas to grand three bedroom townhouses. Rustic log cabins and timbers spaced throughout this expansive resort, give vacationers their own private spot in the woods. The Oaks Course at Christmas Mountain is our championship 18 that was opened for play in 2000. Measuring 6786 yards from the back tees, this par 72 layout "can go toe-to-toe with any course in the Wisconsin Dells area," according to the Wisconsin State Journal. The Oaks Course offers "one of the strongest collections of par 4s around" and is "a gift every golfer should get." The Pines Course at Christmas Mountain is perfect for golfers of all abilities. This challenging 9 hole layout measures 2881 yards from the back tees but don't let the yardage fool you. The Pines Course is heavily guarded by towering pine trees throughout this unique and fun layout. New for 2011 was the addition of Family Tees making the Pines Course the perfect place to learn the game – yet still challenging enough for the most experienced golfers! 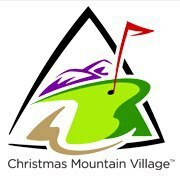 With 27 holes of championship golf, Christmas Mountain can accommodate group outings of any size. Let our expert team take care of all of your event needs and help make your outing a huge success! Our professional staff will help you with all of the details including a personalized GPS setup, personalized bag tags, cart signs, sponsor signs and everything else down to the last minute requests. Every member of our team is driven to make sure that your event is a success. Call 608.254.3971 to book your event today! Christmas Mountain is a great place for you or the kids to learn to ski! Skiers & snow boarders will be thrilled with their new level of expertise after spending some time with one of Christmas Mountain's experienced instructors. Mulligan's Sports Bar N' Grill is the perfect place to kick back and watch your favorite sports teams and events on our big-screen plasma TVs. Splurge on regional favorites like Wisconsin cheese curds and delicious hot meals. The view from Mulligan's is simply unbeatable. Overlooking the golf course, slopes and lighted tree line, Mulligan's welcomes you with a cozy lodge ambiance. If you just want to grab a quick bite and take a break from the slopes, then head to Jolly's located downstairs of Mulligan's. This family-friendly, bar and grill offers a fun, eclectic atmosphere for lunch or dinner. Jolly's is open seasonally. Come in and try our ALL NEW menu. we have to offer on our Calendar of Events here. Before there were water parks, golf courses or even the Wisconsin Dells, there lived a happy, peaceful native tribe who celebrated the natural wonders of Christmas Mountain Village. This Mountain was beautiful. So beautiful in fact, that the tribe took great care to preserve the land, so people for generations to come could enjoy it. Season to season, the tribe enjoyed every new thing offered by the mountain. They celebrated each season, planting crops in the spring, swimming and fishing through the summer, hiking and hunting through the fall and sledding through the winter snows. While the tribe is now gone, their spirit still lives in every outdoor game, activity , and photo you take. So go ahead and get out there. Celebrate the season during your vacation to the Dells... Explore the trails, and keep an eye out for ancient signs from the tribe. Check out this video with some great testimonials from people using a BagJump.